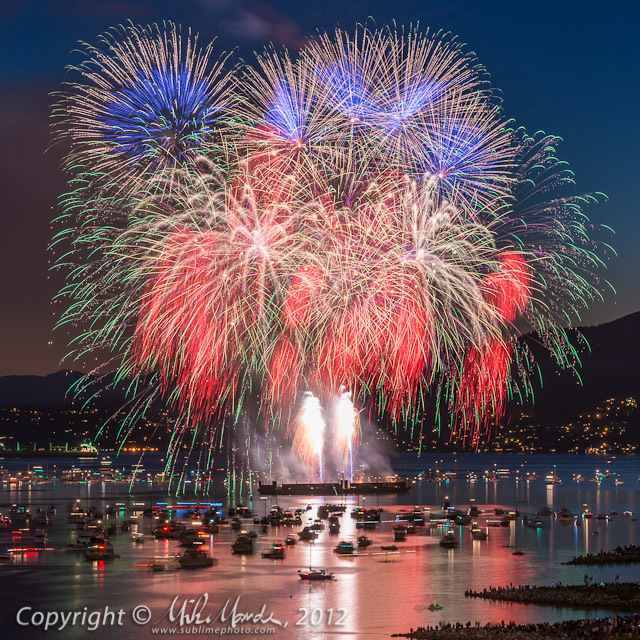 On Saturday, I was out shooting the fireworks from Burrard Bridge once again. Vietnam was the featured country and it was a great show, lots of colour, not much smoke and clear skies. One thing you might notice, if you've ever photographed fireworks before, is how nicely highlight colour is held in these shots. Bright fireworks streamers still have strong colour and are not just blown-out to white. In addition, even on the above small photo, you'll find lots of detail on the beach, seeing all the people standing there, plus there is still even some blue sky showing. This was at 10:21pm, near the end of the show. Visually, it was getting pretty darn dark but the above photo is showing tremendous dynamic range. You'll probably notice that throughout the rest of the image gallery as well.